Haute Residence continues its years-long partnership with acclaimed realtor Alexander Goldstein. As a Haute Residence partner, Goldstein has represented the luxury real estate market in Golden Beach, Florida for three years. 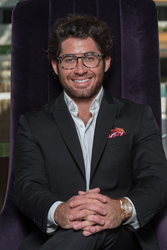 CEO of Miles Goldstein Real Estate, a boutique-sized luxury real estate brokerage, Goldstein specializes in unique, rare, and exotic waterfront and oceanfront properties in South Florida. Among the most prominent professionals in the industry across the globe, he has brokered the properties of Maurice Gibb of The Bee Gees, Baseball legend Sammy Sosa, former President Franklin Delano Roosevelt, musician Jason Derulo, football legend Dan Marino, and singer Stopp Stapp, among others. Goldstein attributes a significant portion of his success to his extensive strategic marketing, market insight, and persuasive negotiation skills. He works hand-in-hand with developers and builders, alike, bringing architectural visions to life. He is able to relate to all walks of life and adapts well to his surroundings due to his diverse background. After obtaining triple degrees in business, international politics, and psychology from Pennsylvania State University, all while competing for the university’s varsity water polo team, Goldstein went on to receive his law degree from The St. Thomas University School of Law. Available 24 hours a day, seven days a week, Goldstein believes there is no substitute for in-depth knowledge, hard work, a positive attitude, and a relentless pursuit of a client’s best interests. His unexcelled business ethics have translated into the acclaim of Miles Goldstein Real Estate, which anticipates and caters to the every need of an upscale clientele. Each associate of the firm has been chosen for their individual skill sets. The result is a team that is unrivaled in knowledge, expertise, and the servicing of clients. Designed as a partnership-driven luxury real estate portal, Haute Residence connects its affluent readers with top real estate professionals, while offering the latest in real estate news, showcasing the world’s most extraordinary residences on the market and sharing expert advice from its knowledgeable and experienced real estate partners. The invitation-only luxury real estate network, which partners with just one agent in every market, unites a distinguished collective of leading real estate agents and brokers and highlights the most extravagant properties in leading markets around the globe for affluent buyers, sellers, and real estate enthusiasts. HauteResidence.com has grown to be the number one news source for million-dollar listings, high-end residential developments, celebrity real estate, and more.